On lobby groups, forums and astroturfing in the Calgary election. The following is a cross-posting from Cory Morgan. When put that way it sounds like a low amount. I thought I would check how it compared to his 2010 election spending. In 2010 his expenditures were $404,229. (pdf document) and the population then was 1,071,515. This equates to $ 0.37 per resident. Our current population is 1,149,552. This means Nenshi's campaign has budgetted to spend up to $747,208 on his 2013 campaign. In 2010 he was in a huge battle and clearly considered an underdog. Now, in 2013, he doesn't even have any real competition yet is planning on such a massive jump. Why spend so much more money when there is clearly no need to? Did they budget so high simply because they had the money and could? How much of this attitude and spending perspective will come into play when he is budgetting our (taxpayers) money? Percentage was calculated using this math; if that stresses you can use this online calculator. Numbers may vary when calculated in NenshiMath. Sadly I haven't been granted access to the magical purple calculator. Election Day is only 12 days away and we still need your help! Gael MacLeod is facing a well-funded candidate who will not release his donor list or show up at Ward 4 forums. Gael has also been designated a target of the Manning Centre, who are putting alot of resources into unseating her. Don't let them get away with it - help us send Gael back to City Council. Gael is clearly attacking Sean Chu, as he is her only real competition. Sean placed a very strong second last time. With fewer candidates this time (5 vs 11 in 2010) and Sean being the only one representing sound fiscal management, he stands a decent chance of unseating her. It has been proven time and time again, well-funded campaigns are not a guarantee to winning elections. It's the candidate, their actions and their ability to connect and resonate with the electorate that will bring success. And if someone hasn't released their donors how can one make the claim they are "well-funded"? I for one, am getting tired of hearing this public shaming of candidates who are not releasing donor lists. There is no such requirement at this time. They are following the law. Period. Laws I might add that were influenced and passed by the current "elected" officials. If you don't like them, see to it that they are changed. Civic politicians like Naheed Nenshi and Gael MacLeod, will say "We tried, but it's Provincial jurisdiction, we can't do anything about it". Well then obviously your opinion and position on the matter wasn't strong enough or relevant to them - so why impose it on others? This constant badgering of the other candidate comes off sounding whiny and very petty. You want respect then raise above these childish temper tantrums. One of the problems with releasing donors early is that it puts individuals privacy at risk. I've seen cases where addresses have been inadvertently posted online. We also have groups like Civic Camp under the guise of being "non-partisan" pressuring people to release donor information. On their affiliate website you can, in some cases, even seen the names of donors who gave under $100.00. Under the law their information is protected and never publicized. They have a disclaimer that this is how the candidates are displaying them as well. I wonder do those people know their privacy has been breached? Did they sign something to agree to their name being made public? As for the Manning Centre I fail to see how Gael feels threatened by them. They are a think-tank. They conduct studies. They hold lectures and training sessions. And yes, they are very politically focused. Did Sean Chu attend any Manning functions or training? I don't know, I do know when I spoke to him about a month or so ago, he hadn't. Besides it's open to the public; anyone, including Gael can take advantage of their resources. In my mind it is continuing education. Something I support and I know Gael does too. As evidenced by her spending while in office. The recent disclosure shows three aldermen expensed more than $10,000 between Jan. 1 and June 30. Ward 4 Ald. Gael MacLeod topped the list with $11,046 in expenses, $4,905 of which was spent on website and communications training sessions for her two ward assistants. To me it is very hypocritical for an elected official to on one hand support spending taxpayers money on education and then turn around and point a finger at someone who "might have" sought out further education on his own time, with his own money!!! How did I even get this email? We moved out of Ward 4 nearly six months ago. I didn't sign up or subscribe to any Calgary candidates email lists. I replied to the email from Gael asking how they got my address. I got a very prompt reply from Pam Krause, Campaign Manager. Pam wrote: I believe it was from when you were a candidate in the 2010 election. I replied with: I didn't use this email during the last campaign. Please confirm for me how I got added to your distribution list. Pams response: I am sorry - I don't actually know that. I am a volunteer on Gael's campaign. What kind of records are they keeping if they can't tell when or how I was added to the list? Even a bare-bones campaign will use an Excel spreadsheet and retain such information. And really Pam, you may be volunteering, but you have the top level position - it's your business to know these things. Since Gael was elected I have corresponded with her using this email address (the address this email came to). There were a few emails on personal matters that I sent to her at the Aldermanic office and later there were group emails involving the Highland Park Community Association which I was a member of at the time. Gael knows I moved, she acknowledge that on Twitter just a few weeks ago and she knows I'm supporting Sean, so it is highly unlikely she would purposely add me to her campaign distribution list. This leads me to believe other lists were imported into her database. Either a list of people she has had contact with via her role as an Alderman or lists of active Community Association members. If it is the former, then she has abused information gathered as an Alderman; if it is the latter, then she has misused information that was to be strictly used for Aldermanic, non-political work with communities. If either of these are indeed what happened, they are very disappointing actions for an elected official. The Alberta Party, a sad waste of a good name. So far as registered political parties in Alberta go, the Alberta Party has by far the coolest and best name. It’s been around since the mid-eighties and more than one other party has tried to get their name. 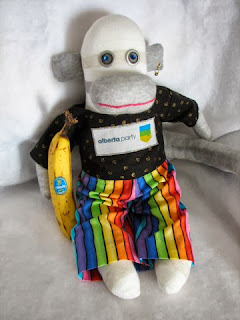 The Social Credit, the Separation Party of Alberta and the Alberta Alliance all made attempts at mergers through negotiations and all failed. In 2010 people from the failed “Renew Alberta” movement and the defunct (deregistered) Alberta Green Party were successful in a quiet takeover. They managed to attract some intelligent and well spoken individuals, like Chima Nkemdirim and Naheed Nenshi. Many feel they took a big hit to their rise as a real party when Nenshi became Mayor of Calgary. He really was their only hope at having a quality leader. They also saw a glimmer of hope when Dave Taylor crossed the floor to sit as an Alberta Party MLA. That was short-lived as Taylor didn’t run in the following election. I’ve heard some explain his actions as a “final ego trip” before retiring. Social media can be a deceptive thing. For example, Marc Doll one of their biggest cheerleaders, recently admitted (after getting caughtred-handed) to creating a “sock puppet” account on Twitter. He said many people had access to it. So you know if there is one fake account, there likely many, many more. They do use the latest in technology, like online and telephone voting, live streaming of their AGM’s and other meetings. However in doing so they have cut themselves off from both a huge voting demographic and forgotten how to use tried and true methods of reaching people. Case in point: My husband Cory purchased a membership, he never received a membership card; in fact he has never received any correspondence via regular mail from the Alberta Party – not even a ballot or voting information for the Leadership vote happening this weekend. And from the sounds of it many others didn’t receive anything either, since on Friday morning they sent out a last minute emails to everyone. So far as their new way of doing politics – their “Big Listen” turned into a Big Flop. No clearly defined policies, no one knowing where they stood on issues – in fact you could ask two or more members and get two or more widely different answers. On February 23rd of this year the Alberta Party held a “Special Constitutional Meeting” to make some amendments to their Constitution/Bylaws. They made some bizarre changes, like allowing the Leader to be a voting member of the board and keeping the board size at an inflated 25 members. From that we can calculate they had nearly 3200 members in February. Just days ago it was reported that they have580 members eligible to vote for the new leader. This means that over 2500 people, who likely purchased memberships in March/April of 2012, decided not to renew. Even the Wildrose in 2009 (year after an election) had nearly 1200 members and exploded to 12,000 during its leadership race. If the Alberta Party had a hope of growth post-election, this should have been it. Well one percent is indeed a very attainable goal with only 580 members. Heck at 5.8 people only ¼ of the provincial board could show up and they could have a valid AGM. Is it just me or isn’t that downright absurd? They need the majority of the 25 directors at board meetings – so 13 people; yet only need 6 at AGM’s??? I asked yesterday on Twitter how many were registered to attend. The President, William Munsey replied saying “50 or so”, well above their required quorum. 15(1) The bylaws of a society shall not be rescinded, altered or added to except by special resolution of the society. (2) No rescission or alteration of or addition to a bylaw has effect until it has been registered by the Registrar. (3) If the Registrar is of the opinion that a bylaw is not in accordance with the application for incorporation or that it contains anything contrary to law, the Registrar shall refuse to register it. It is 15(2) that is important to note. Societies can vote on all sorts of things, but until the changes are filed the bylaw has no effect. Actually not only do they need to be filed, but as you can see in 15(3) they have to be accepted, as the Registrar can refuse to register it. It took the Alberta Party a very long time to get their revised Bylaws and Constitution posted on their website, it just showed up this past week. That got me thinking, if they didn’t have it amalgamated into one document until now (7 months) after the Special Meeting, what were the chances that the changes were in fact filed and approved by the Society’s Registrar? I went down to a local registry office and requested a list of directors and a copy of the current bylaws and constitution. They were able to give me the list of directors and a detailed history of all changes and documents filed. The copy of true and current bylaws will take a couple business days to come to me. With the information I did get though, I can already see that no changes or documents have been filed in 2013. 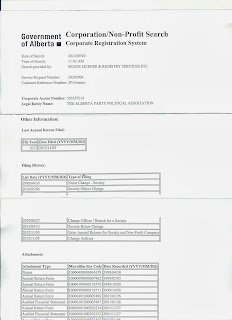 The most recent change being an update to their address and the most recent documents filed being the annual return; both filed November 5, 2012. Now, I’m no lawyer, but I do know from past experience - a party can’t presume to operate under amended bylaws until you receive the confirmation letter from the Society’s Registrar that they have been accepted. To me this would indicate that the Alberta Party is still governed by (what they believe to be) their previous bylaws. The bylaws that require 25% of membership at AGM’s to meet quorum. With 580 members they will need 145 members in attendance at today’s AGM in order for it to be valid. Will this impact the Leadership vote? Likely not, I suppose the losing candidate could make a case for it. However, I believe it would invalidate any other party business done at this AGM; the election of the new board for example. Indeed there are many who would argue, that unless quorum is present at the onset of the meeting, it shouldn’t even proceed. I've had a couple of exchanges on Twitter today and it would appear the Party thought my concerns valid enough to seek legal advice. According to Chris McClure "legal council says no problems" This is great news and as you can see, I asked if they would be issuing an explanation to members. Apparently they are going beyond that and have issued a press release, which they say will be covered on Global TV tonight. You can see that information in the same link by scrolling down to see responses from "suepeac" and "SusanPeac". I suspect they are one and the same person. It would be an incredible coincidence that two people, with nearly identical names, are both huge Alberta Party supporters AND just happen to respond to questions directed at the other. Guess what's wrong with this picture. 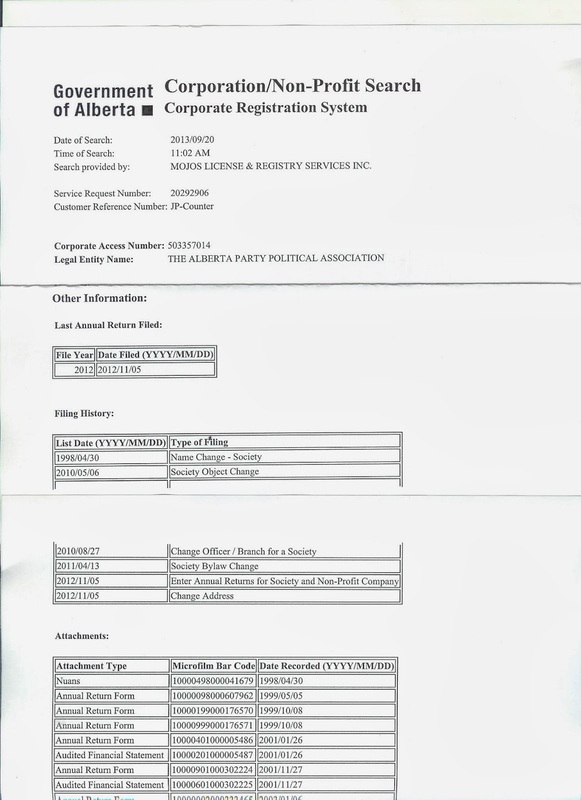 Take a close look at this document - see anything amiss? Here is a huge clue for you. Spotted this at my local Tim Horton's this afternoon. They must have an aspiring Red Green on staff. The following video is the result of a creative endeavor by Amanda Achtman and friends. While I was only a member of the PC party for three weeks; I have many friends who are still hanging in there hoping for "change from within". For those who have left, I think Amanda has captured how they now feel.